• Pay after you pass! 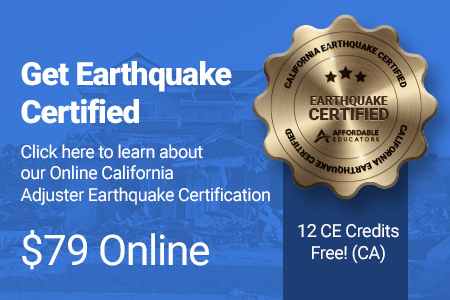 PRO TIP: Consider taking a 12 Hour CE Course then get Earthquake Certified to meet the rest of your CE hours. Updated for 2018! One course meets all your CE. Satisfies Ethics, too! Need a book version of these courses? Click Here. You MUST be Earthquake Certified to Adjust Earthquake Claims in California. Satisfies California's Required Earthquake Training for Adjusters. Required Every 3 Years. State Approval #272548. The California Earthquake Authority (CEA) has recently revealed they keep a list of adjusters who are earthquake certified. Not on the list when the big one hits? You won't be able to adjust earthquake claims in California. Learn why thousands have trusted Affordable Educators with their California Continuing Education needs. Open book format with an easy to follow index and word search. do one class for all your needs. Affordable Educators has been keeping agents compliant since 1993. More than 80,000 industry professionals have used our program for Continuing Education. Our licensing program offers the best in exam prep. California approved, provider 20537.